Sometimes it is kind of hard to say no to some people, apparently those people can be friends, family or loved one and many others. But saying no to even a closed one is not a crime. Saying no can save someone’s life and it also has the credibility of ruining things. Therefore, saying no is not that hard thing to say while rejecting someone’s approach. Moreover, this discussion about saying no, can be extended to an even workplace and i.e. 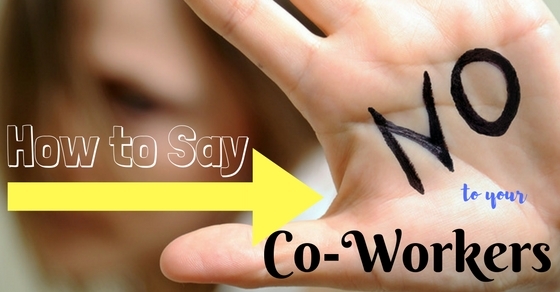 to learn how to say no to co-workers. It is not necessary that people need to learn how to say no to their co-workers, but sometimes when a person really needs to think about their objective goal in their professional life, then they have to start thinking about their career and analyze the situation properly to say no for their own good. It is a common scenario in the workplace that while working one of the colleague could ask for a work favor and at that time the approaching person might think it through and without any hesitance he or she might agree to help their colleagues in the work. But later on when the colleague explains everything about the problem for which he or she need help, then the person need to decide whether it is possible to help that colleague. And for that, a person need to analyze the issue and also cross check their duty objective to continue the approval process. Sometimes people have a nature of dismissing the request even before hearing it out, which is completely understandable. But admit it dismissal without hearing it can be termed as professional and everyone has their own professional issue so instead of wasting time people just ignore that particular conversation. Moreover, being professional is considered as being smart and polite, so it would be better if the person hears what the other person want to discuss about, then decide to say no by ending the conversation and justifying it. In some situations in the workplace, there is a possibility that some people might think of a person as a competition and they even might be waiting for the chance to make one feel like a total loser. And at that point, if that person approaches others for a favor then taking advantage of that situation is not correct. Therefore, it is advisable for all the professional people out there that whenever a person comes and asks for a favor, just think over it and say yes or no without wasting much time. Some people behave kind of a bit rude in the workplace, especially those who are in a higher position or those who recently got promoted. Perhaps, when a person who is a colleague approaching another colleague from their department for a favor, then it is up to them to decide whether they want to help them not. If the person decides to say no, then he or she definitely owns a justification for saying no. Moreover, that justification can help that person understand the other person’s reason for rejection. Most of the time because of some of the colleague’s opinions the rest of the staff can think of the person as not so great one, but actually being professional in one’s work can let others think and start gossiping about that person. So it is better for that person to maintain a healthy relationship with the rest of the colleagues of their workplace and he or she can make that happen by occasionally helping them out with their work. Because if he or she keeps saying no, then people in the workplace can pursue as a bad guy. As the working process goes in the office, most of the people maintain a professional approach during their completion of duties and responsibilities. So it is always better to be polite in the office with the colleagues so that there won’t be any sort miscommunication between them. Being polite also helps a person in a manner that he or she can maintain a healthy relationship with the colleagues in their workplace. Therefore, it is necessary for a person to understand that to survive in the workplace, he or she need to create a connection with the people in that office and for that he or she need to be polite with all of them. In some situations when a person approaches their colleague in the office and that colleague have their own constraints and limits regarding their request, then at that he or she need to make others understand about their situation. Or else a person can estimate their limits and to what extent he or she can help that colleague with their request. Therefore, if a person is willing to help a coworker, then he or she should estimate his or her limitations while helping their coworkers. There are some people in the workplace who are incapable of handling no or replying no to anyone. And those people can be considered as an easy target for everybody while asking for help. So it is always better for those people who cannot say no to people that they need to determine the request first, before saying yes to such request. Therefore, such people need to think of an alternative solution for the problem and provide the possible solution to a coworker without any hard feelings. There are several benefits of saying no at the workplace. It probably makes one stand for themselves. Saying no is not an obligation which people need to consider while dismissing certain task or request. Most of the people keep on saying yes to things which is unnecessary for them personally and professionally, but still they try to maintain their answer by saying yes. It is a good thing that some people think that saying yes to every single task can get them that particular level of position in the company. Unfortunately, such thinking never favors in the world of business. Therefore, the employees need to understand their limits and stand or opinion about certain things which actually matters to them. Some people have a habit of manipulating people with their talent, smartness and beauty. But it is nothing but taking advantage of one’s affection and friendship. Therefore, it is necessary for every employee that they need to understand how to find out such colleagues who are into taking advantage of people in their workplace. And after finding that quality in a person, then people start finding ways to say no to them and eventually they will get paid for the work they do. As it has been explained earlier that some people take advantage of people who says yes, all the time instead of no. Apparently, those people might handle all those work which is unnecessary for them. Which means some people might ask for their help but because of their habit of saying yes, that person might lose their personal time. Therefore, employees need to understand the meaning of saying no at the workplace. There is a possibility that if a person starts saying no at their workplace, then it is possible that he or she will be targeted for their dismissal behavior. But in a professional manner, this type of behavior can let that person be more professional with their duties and responsibilities. Saying no can be hard for people, but it is very much helpful during stressful times. It eventually develops someone’s thinking about certain tasks and projects. Therefore, as saying yes can create healthy relationships in the workplace, apparently saying no can even provide better career growth in their professional life. So one needs to learn how to say no. Finally, the bottom line is that saying no to a coworker can be a little tricky while working in the office, but saying no by maintaining a professional relationship with the rest of the staff can help that person to continue their healthy relationship with everyone in the workplace. Therefore, at the end of this discussion over how to say no to a coworker, all the readers might understand how difficult it is to say no to a coworker. Moreover, there are some ways to practice in the workplace when someone asks for a favor and one even can help that person without dismissing the other person’s request.